Our NEW sporty-style, Move shoe, is proven to protect your knee and ankle joints when you’re on the go. In tests by the University of Central Lancashire it was shown to deliver between 23% and 25% less impact shock to the lower leg than other leading brand trainers. This is due to our new Cushion Active Underfoot Comfort System which offers an exceptional level of shock-absorption and cushioning. As well as giving you an outstanding level of underfoot comfort, Move has a lightweight, super-flexible sole that flexes with your foot for maximum comfort. 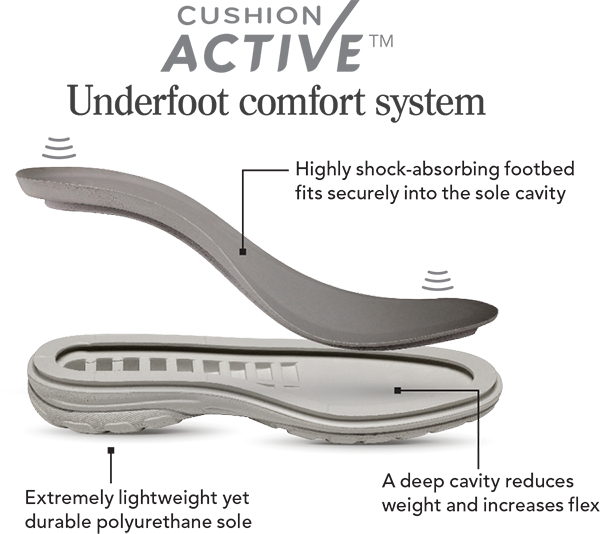 A padded tongue also cushions your instep as you walk and it has a deep, seam-free toe box that provides excellent protection for sensitive toes. The soft, padded collar around the ankle fits both swollen and slimmer ankles. Order your pair today - click here.